I tried making Panna Cotta with the Kefir instead of buttermilk and it works great and tastes wonderful. Not just an every day dessert, it’s nice enough to share with company. Turn the cups out onto a dessert plate add a sprig of mint or slice strawberries and it is fancy enough for guests. Put gelatin and 2 tablespoons of water into a small bowl to soften for 5 minutes. Pour cream into a saucepan with sugar heat just to melt sugar, remove from heat. Add softened gelatin and stir to be sure it is incorporated. Add kefir and vanilla extract. Pour into small pudding cups and refrigerate. Yum! 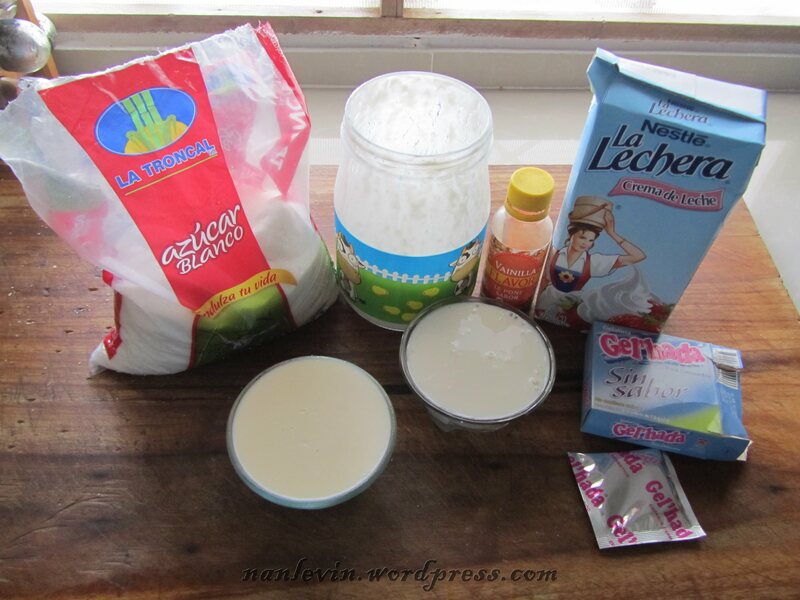 We fell in love with kefir when we were living in Panama. Some sweet soul, sorry I forgot who gave me the culture, was kind enough to share their kefir grains with us when we lived their over five years ago..
Kefir is a cultured, creamy product with amazing health benefits. Kefir is tart and has a refreshing flavor similar to a drinking-style yogurt or buttermilk. It contains beneficial yeast as well as friendly probiotic bacteria found in yogurt. The grains are just that, they look like little grains of rice. 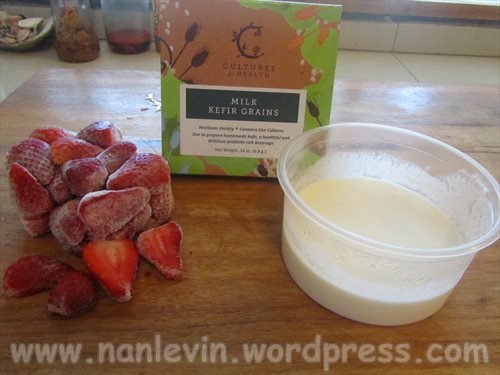 You start with about one tablespoon of kefir grains and you add milk. It can be cows milk, goats milk, raw milk and even boxed milk works. Leave the milk mixture on your kitchen counter for 18 to 24 hours in a glass container. Do not close the lid completely or drill holes in the top to allow air to escape. Use a coffee filter with an elastic band to cover to keep little critters out. Strain using non-metal strainer into a clean storage jar. If you want a richer more tart flavored kefir – allow the kefir to sit on your counter for a few more hours after you have removed the grains. This gives you fresh kefir every day in any quantity that you need. Kefir is a great preventative probiotic which will promote gut health, absolutely necessary while living in this climate. I received this kefir from Rodger and Glennda Kauffman who are living in Bahia de Caraquez. The culture is very healthy and is reproducing grains which I will share with anyone who may be traveling through San Clemente. You can use kefir to make smoothies using the fruit of your choice if you are not a plain yogurt eater. 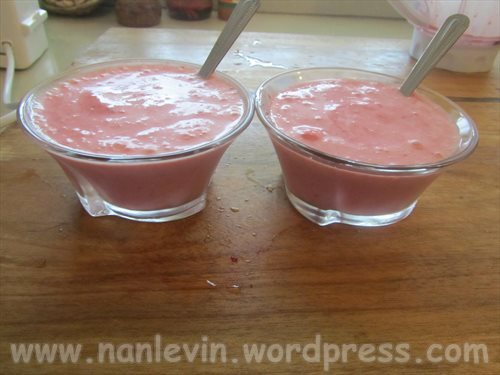 Plus one of my future posts will be for a dessert called Panna Cotta using kefir. Really yummy…. While living in Panama, I was given a gift of Kefir Grains. I did not know anything about kefir at the time but decided to try it. What a wonderful yogurt type drink it makes. I think it is more flavorful than anything you buy in the store. First I guess I need to explain that kefir is a probiotic beverage. I have purchased two types of grains: milk kefir grains and water kefir grains.The milk kefir grains can be used with cow milk, goat milk or coconut milk. The water kefir grains can be used with sugar-water, juice or coconut water but more on water kefir when I start working with that in a few weeks. 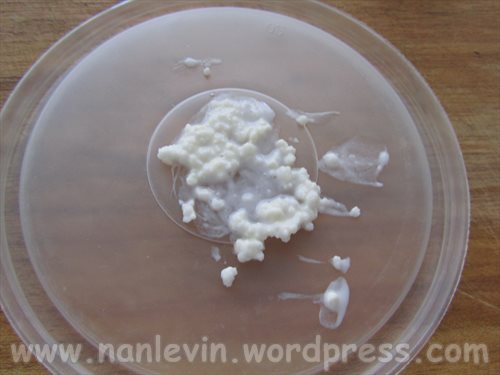 Kefir grains consist of bacteria and yeast existing in a symbiotic relationship. 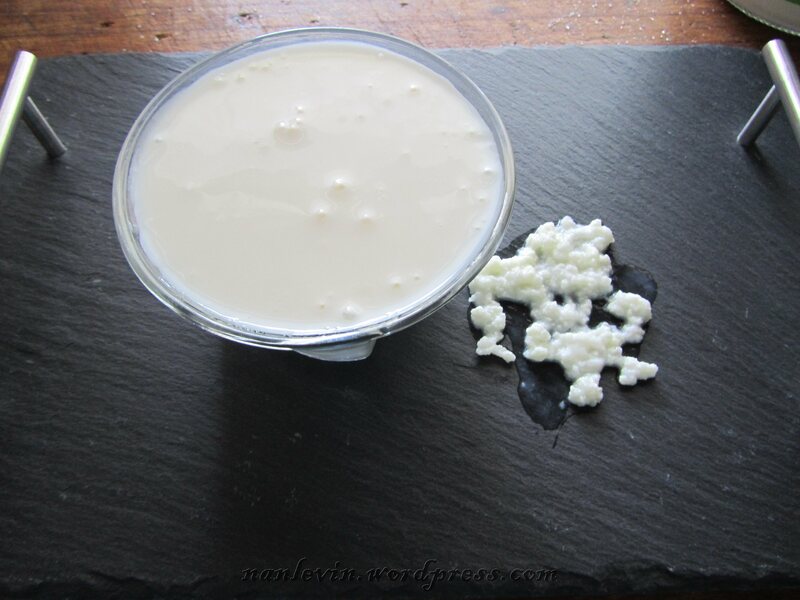 The term “kefir grains” describes the look of the culture only – it is not a grain at all. I purchased these grains from a company in the US and had a friend bring them with her when she visited the states last month. They come in a dehydrated state and need to be rehydrated with milk to work properly. I have a supply of raw milk delivered to my door three times a week. For .60 cents I buy a quart of beautiful full fat milk that I have used for making puddings in the past. Now I am using it for my kefir. It will take up to 8 attempts to get my grains really producing. Right now I am only making one cup at a time to get the grains to multiply. Once they start to multiply I will have more grains than needed and will eventually be able to share with friends and neighbors. The result, using one cup of kefir with a half pint of fresh frozen strawberries, was two dessert dishes of almost soft-serve consistency. No sugar added just the fresh frozen berries with the tart kefir…it was a hit.